Four old musketeers are lounged around outside the store’s entrance. Their lightest vehicle – yes, it is the good old bicycle – is parked just alongside. So attentive to their pal in the middle, the quartet seems to share some misadventures of a bygone lifetime. And then it suddenly it is Fathija Mosque, one of the most sacred sites for Muslims in Bihac that comes to view. A few metres away it is the Sacred Heart Cathedral, the centre of Catholic worship in Sarajevo. Meandering between mosques and churches, you will be greeted by the vast swathes of striking space of a faraway land. Bosnia to Sri Lanka is what Jaffna to Colombo. A conflict-ridden country striving for some kind of reconciliation is the painting that media has managed to offer on the country. Yet, the recent exhibition held in the Colombo Swimming Club opened doors to a different experience. The experience was almost surreal transporting the connoisseurs to a hitherto unearthed stratosphere. 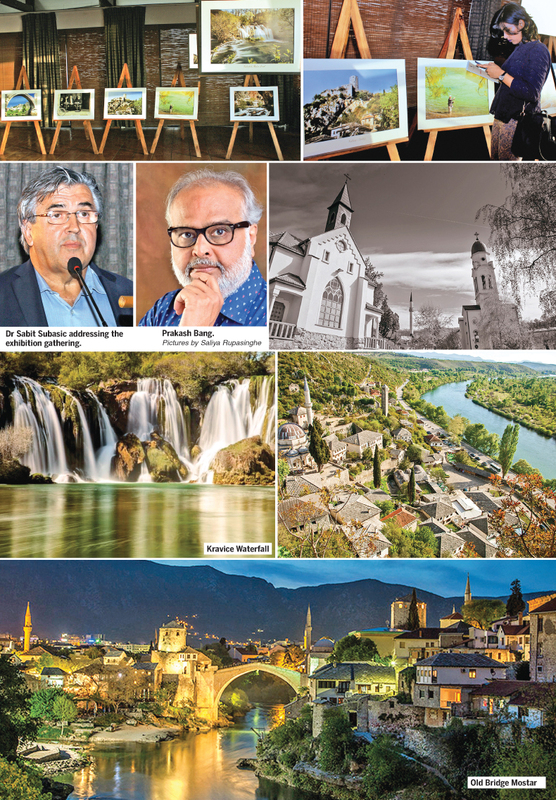 Pune-based Prakash Bang’s dreamlike captures of Bosnia and Herzegovina reached the Sri Lankan cultural circle thanks to Bosnia and Herzegovina Ambassador Dr Sabit Subasic and Honorary Consul for Sri Lanka Jitendra Warnakulasuriya who hosted the photography exhibition. Titled Splendours of Bosnia, the exhibition featured 19 odd photos by Bang. A marketing strategist by profession, Bang has taken to photography as a hobby. The very hobby keeps him stimulated to explore the world inside out. His profession demands to him to be a constant globetrotter. The world is his physical space where his business exists and his passion prevails. His business feeds his camera to capture the world. Prakash obtained an Honours Degree in physics and went on to study Master in Business Administration (Marketing). His relationship with science ended as he took over the business administration. Living in Pune about half the time, he is clueless where he would spend the rest. For the last 45 years, and counting, Prakash earned my bread by working as an advertising & marketing professional. “Photography was always a very serious hobby for me. It all started when my dad gifted me his Rolleiflex camera when I was 14. It was an expensive hobby then. Films, developing, printing and then keeping the fingers crossed with the hope that it all will turn out well! Now, in the digital era, things are becoming a bit cheaper and one can afford to experiment a lot. Landscapes and street photography is what I love the most,” Prakash notes. With a business on sound footing and his sons on the job, over the last decade or so Prakash began spending more time with his camera. Since he has been associated with the travel and tourism industry it presented him ample opportunity to travel around the world. Instead of returning home on weekends or hanging out in front of the TV, Prakash fell in love with this newfound hobby of exploring and shooting. Incidentally, Prakash’s cousin Suhas Mantri, Consul for Bosnia & Herzegovina for Maharashtra and Goa, India, insisted that he takes on the responsibility of developing tourism from India to BiH. He had faith in Prakash. Suhas Mantri was confident that Prakash’s experience and hobby should do the trick. That’s how it all started. 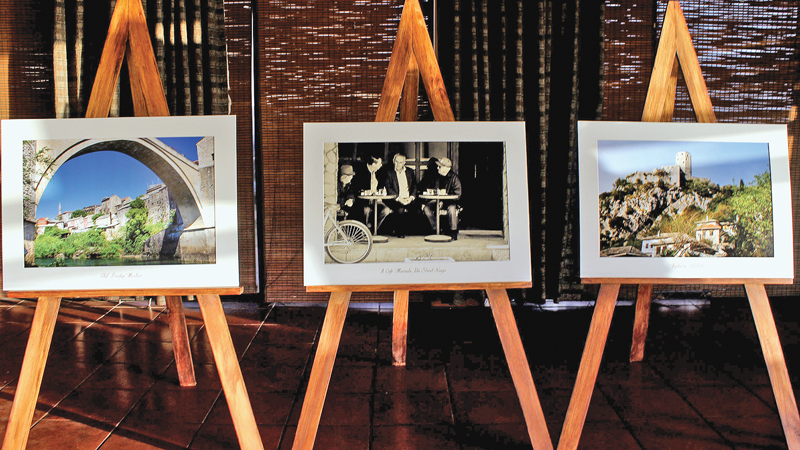 The first exhibition was held at Pune, India. It went off really well with thousands visiting the show. The next exhibition was held at Mumbai which also had excellent footfalls. It was then repeated in Kolkata (which also has a Hon. Consulate) with good results. Then it occurred to Dr Sabit Subasic, Ambassador for BiH that it would be prudent to hold exhibitions in Dhaka, Kathmandu and Colombo, Sri Lanka. Dr Sabit Subasic had one major objective in holding the exhibition. He had the intention to promote awareness about the importance of sustainability. Four years ago, Dr Subasic initiated the establishment of the Centre of Multi-Ethnic and Multi-Religious Tolerance and Understanding, an NGO which has a purpose to promote better relations and understanding among different ethnic and religious groups and societies in the Balkan region.